Of all the beings in Nosgoth, Moebius more than anyone eludes a linear description of his history. Chosen long ago as the Guardian of the Pillar of Time, Moebius has little difficulty in appearing any-where and any-when he so chooses. From his base of operations in The Oracle’s Cave (or ‘The GitCave’ as it is known to the inhabitants of Nosgoth), he uses his time-travel abilities combined with an aeons-old piece of Hylden technology called The Chronoplast, to further his own dodgy ends. 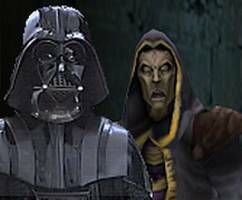 Soul Reaver 2 revealed that Moebius, employed by the Dark Forces, had successfully created an alternate timeline by manipulating Raziel into a situation where Kain would save him from being consumed by the reaver. In the alternate history that followed, Moebius and the rest of the Circle of Nine were never killed, and are free to cause havoc until an accident of their own making rectifies that particular paradox. 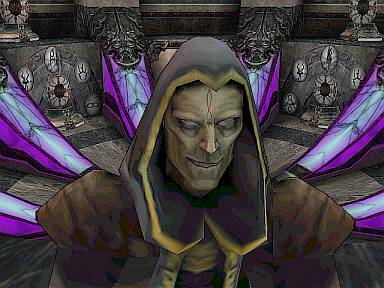 The Dark Forces, very satisfied with Moebius’s role in creating an alternate Nosgoth, rewarded him. 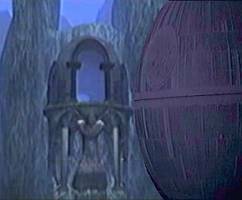 Moebius now has his own fully-armed-and-operational-battle-station, a new loyal apprentice in the form of Darth Vader, Dark Lord of the Sith, and a Clone Army of tens of thousands of Turels. Having parted ways with the Dark Forces on good terms, Moebius is free to use the incredible resources at his disposal whenever and wherever he likes. For Moebius, life is just peachy, the old man was happy being, well, nothing more than a complete and utter time-streaming git.